There is a lot of confusion about Obamacare, so I’m going to take a short moment to explain what the bill actually contains. If you go to Wikipedia and type in “Obamacare”, the Patient Protection and Affordable Care Act comes right up. It has eight main provisions which I will explain one by one. 1. Guaranteed issue prohibits insurers from denying coverage to individuals due to pre-existing conditions, and a partial community rating requires insurers to offer the same premium price to all applicants of the same age and geographical location without regard to gender or most pre-existing conditions (excluding tobacco use). So, for example, if you are a young person with diabetes and fall off your parent’s insurance plan, you cannot be denied health insurance coverage and you will pay the same rate as another young healthy adult. If you have any health problems, insurance companies have to take you in anyways, and you will have the same low rate as anybody else. The only exception to this is if you smoke. 2. Minimum standards for health insurance policies are established. 3. An individual mandate requires all individuals not covered by an employer sponsored health plan, Medicaid, Medicare or other public insurance programs (such as Tricare) to secure an approved private-insurance policy or pay a penalty, unless the applicable individual has a financial hardship or is a member of a recognized religious sect exempted by the Internal Revenue Service. The law includes subsidies to help people with low incomes comply with the mandate. If you do not have health insurance, you will be required to purchase it. But what if you can’t afford it? After all, if you don’t have health insurance, chances are, that’s because you can’t afford it. So how will this work? Well, you go onto the new healthcare.gov website and sign up. You’ll be asked about your finances, and depending on your situation, if you cannot afford it, the federal government is going to help you pay for it. As for those who can afford health insurance but are not on a health plan, you will be fined by the IRS on your tax returns. They’re going to make everyone get insured one way or the other. 4. Health insurance exchanges will commence operation in every state. Each exchange will serve as an online marketplace where individuals and small businesses can compare policies and buy insurance (with a government subsidy if eligible). In the first year of operation, open enrollment on the exchanges runs from October 1, 2013 to March 31, 2014, and insurance plans purchased by December 15, 2013 will begin coverage on January 1, 2014. In subsequent years, open enrollment will start on October 15 and end on December 7. Despite what you may have been hearing, President Obama’s healthcare policy is not a government take over of healthcare. Obamacare sets up a healthcare exchange where private insurance companies compete for your business. It’s a free market solution. If you read the history of bill, Republicans actually endorsed this plan and have proposed similar plans over the past twenty-five to thirty years. Why they’re being so obstinate now is beyond me. For example, in 1993 Senator John Chaffee (Republican) proposed the Health Equity and Access Reform Today Act, a similar sort of plan which had individual mandates, penalties for non-compliance, “universal coverage”, as well as subsidies for those who cannot afford it. In 1994 Senator Don Nickles (another Republican) proposed the Consumer Choice Health Security Act, which also had an individual mandate and penalties if you didn’t comply. Republicans proposed these sorts of plans under George H.W. Bush in the early to mid-nineties, so it’s strange that constitutional issues are being raised. 5. Low-income individuals and families whose incomes are between 100% and 400% of the federal poverty level will receive federal subsidies on a sliding scale if they purchase insurance via an exchange. Those from 133% to 150% of the poverty level will be subsidized such that their premium costs will be 3% to 4% of income. In 2013, the subsidy would apply for incomes up to $45,960 for an individual or $94,200 for a family of four; consumers can choose to receive their tax credits in advance, and the exchange will send the money directly to the insurer every month. Small businesses will also be eligible for subsidies. As I mentioned, if you don’t have money, they’re going to to help you pay for your health insurance. Sign up on the website and depending on your income, you will receive the appropriate level of help. 6. Medicaid eligibility is expanded to include individuals and families with incomes up to 133% of the federal poverty level, including adults without disabilities and without dependent children. The law also provides for a 5% “income disregard”, making the effective income eligibility limit for Medicaid 138% of the poverty level. Furthermore, the State Children’s Health Insurance Program (CHIP) enrollment process is simplified. However, in National Federation of Independent Business v. Sebelius, the Supreme Court ruled that states may opt out of the Medicaid expansion, and several have done so. 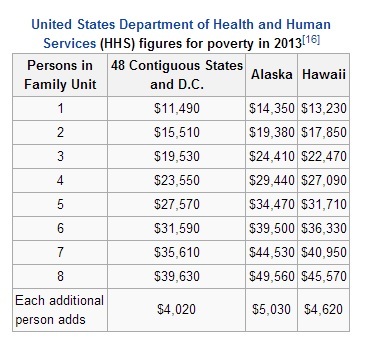 If you and your family are in poverty, Obamacare originally intended to pay for your healthcare in its entirety. If you fell below 133% of the federal poverty income levels, you would be put on Medicaid and all your healthcare expenses would be completely insured. How is poverty defined? Well, it depends on the number of members in your household and your total household income. Here’s a small table to help you get an idea. If your family’s total income is less than 133% of these amounts, and your state is expanding Medicaid coverage, you will soon have full healthcare coverage under Medicaid. However, things didn’t go as planned. There was a provision in the bill where states could opt out and not fund the program, and that’s what happened in the states with the largest number of poor citizens, unfortunately. I’ll include a map so you can see which states funded the program and which did not. 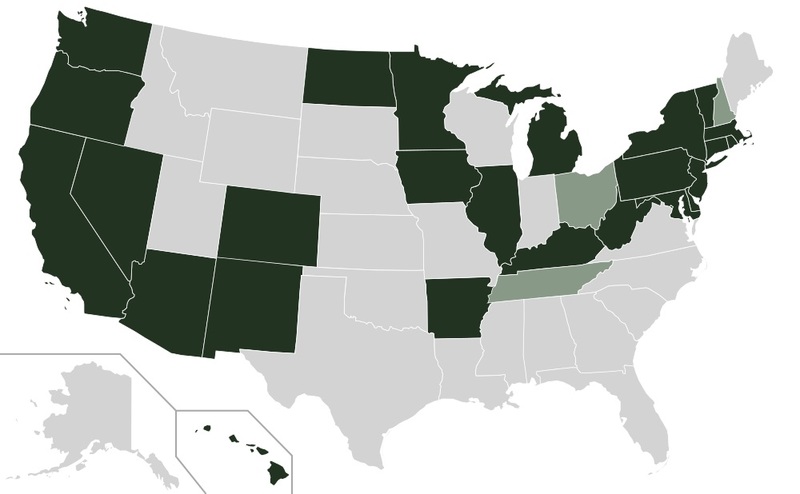 The dark green states have expanded Medicaid coverage and will take care of all poor people in their states. Light green states are still deciding what to do, and light gray states (uncolored) will not be expanding Medicaid coverage to the poor. My state of Missouri is being the most obstinate of all. Missouri will not even be involved in the health insurance marketplace nor will they expand Medicaid to these poor individuals. Our governor and politicians are actively running campaigns to discourage enrollment or any compliance with these programs. So, it’s a mess. Take a look at this map of poverty within the United States. The states with the poorest citizens are also those most obstinate against getting coverage. I find it strange to see people in need, crossing their arms, telling you that if you help them get coverage, somehow you’re contributing to the ruin of our nation. What can you do? The Republican party is so against this idea of helping the poor, they have literally forced a government shutdown because they absolutely and resolutely refuse to help poor people pay for healthcare. They won’t do it. As for the rest of Obamacare, it’s a free market solution, created by a Republican businessman, so they really have no excuse to fight against it. 7. Reforms to the Medicare payment system are meant to promote greater efficiency in the healthcare delivery system by restructuring Medicare reimbursements from fee-for-service to bundled payments. Under the new payment system, a single payment is paid to a hospital and a physician group for a defined episode of care (such as a hip replacement) rather than individual payments to individual service providers. In addition, the Medicare Part D coverage gap (commonly called the “donut hole”) will shrink and be completely closed by January 1, 2020. 8. Businesses who employ 50 or more people but do not offer health insurance to their full-time employees will pay a tax penalty if the government has subsidized a full-time employee’s healthcare through tax deductions or other means. This is commonly known as the employer mandate. Bigger, more successful companies have to offer healthcare coverage to all their full-time employees. Unfortunately, I think this is going to lead a lot of companies to cut people’s hours so they don’t have to provide benefits, but it’s nice to see the government trying to force these big corporations to take care of their employees. They’re all earning record profits. Big companies like Wal-Mart used to give their employees benefits. We’re just dealing with an unprecedented level of greed. I see this debate on Obamacare as a debate on morality. Different people have different ethical systems and I think it’s silly to try to coerce other people into accepting your moral system or pay money to enforce values in your moral system, because there are no objective values and no moral system is better than other. It’s all about “I like it” or “I don’t”. If you like to help poor (via taxes) — great! If you don’t — okay! Just don’t try to persuade others that pizza is better than chocolate. It certainly is a moral issue, but saying I shouldn’t argue my own views on morality on my own personal blog is quite strange. I don’t really like approaching it from the angle you’re coming from. Let’s ask ourselves what freedom is, because it seems your argument rests on the libertarian idea that taking money in taxes to pay for the healthcare of poor people is unethical. If we lived in a free society, people could freely take their own money and take care of the poor, if they wanted to. If they don’t want to, then they don’t have to. But think of it from another angle. In life, we can live any way we want and we can structure our society by any agreed upon set of rules that we like. If the vast majority of people get together and say, “We want to live like this”, wouldn’t a truly free society structure themselves in that way? That’s the very idea of democracy. Most Americans want a healthcare system that takes care of the poor, so taking their tax money to pay for it is not unethical — that’s what most of them want. That’s what they’re asking for and are frustrated that their leaders will not represent them or do what they ask. The minority (the rich) who control the politicians are those who do not want it. You may say that this is the tyranny of the majority over the minority. Such is life. Not everyone gets their way. We’ve agreed as a society that people have certain rights, such as freedom of speech, religion, etc., and that the majority cannot force people to be silent, stop them from freely getting together, etc. But those unalienable rights do not apply to every aspect of society. The majority of people get together and say, “This is what we want”, and we want a healthcare system that provides for the poor. The libertarian idea which says that if people cared, they should take care of the poor with their own money could never be effective in practice. Each and every person, individually, would have to fully understand find search and find out where to best give their money, and it would be a huge undertaking. Think about how difficult that would be on a person. Imagine driving around town trying to find people in need, having no reliable information about people’s finances, situation, etc. All you have is an extra $25 in your pocket. You’d waste that small amount in gas trying to find someone give it to. That’s what a society is. When I listen to your argument, I imagine myself standing with that majority of Americans who want to take care of the poor and we hear you telling us, “You all cannot freely live how most all of you want to live. Instead, you can’t do what you want to do because this small group of people over there don’t want that.” Well, tough. As you said, why is their opinion any better than ours? So, majority opinion wins in democracy, unless that majority opinion infringes upon certain rights, such as freedom of speech, freedom of the press, freedom of religion, etc. I’m sorry if my previous comment was offensive, I just can’t understand how is it possible to argue on utterly subjective issue like morality. Yes, you’re right. Even completely socialist society can be completely free/libertarian as long as everybody is agreed on rules. Well, I’m not a libertarian because I think that it’s better for economy or it will have effective charities, or anything like that. I don’t care. I don’t claim libertarianism to work for everybody or to work at all. I just really like to be in control of myself. That all. Yes, I think that taxing is unethical but I don’t say that my ethical system is better than other systems. I understand that people are different, and most of them are not crazy on liberty like libertarians. Why it has to be either everybody pays or nobody? Why can’t only people who voted to take care of the poor pay for the poor?